Essential oils are great for enhancing and maintaining your beauty. Many people prefer essential oils over beauty cosmetics as these oils are natural and without any chemicals. They are also cheaper than most of the cosmetic products that you get in the market. 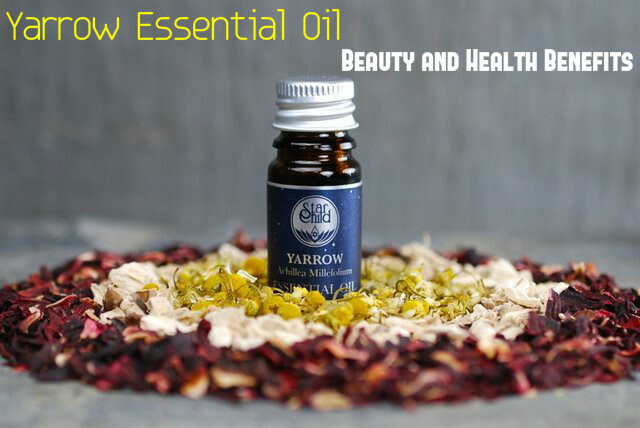 Yarrow essential oil is one such product that is very beneficial. Yarrow essential oil is known for its astringent properties. The function of an astringent is to bring contractions in muscles, tissues and also blood vessels. When it this property is present in toothpastes, it can cause contraction of the gums. This helps in keeping the teeth secure. In case of hair follicles and scalp, it helps in making your hair stronger and prevents hair fall. Applying yarrow essential oil on the skin can improve the condition of saggy skin and muscles which have resulted because of aging. As a result, your skin will look much younger than your actual age. This is because of the astringent property of this oil. Moreover, it can also reduce bleeding or haemorrhage by contracting the blood vessels. So, yarrow oil is very beneficial for you. People often suffer from water retention at some stages of their life. Water retention can pose a threat to your weight loss goals. Unless it is cured, you will never be able to lose weight effectively. So, you have to get rid of the toxins, salts and excessive water from your body. This you can do so with the help of yarrow essential oil. This allows you to lose weight because when the water weight is gone, your body will be toned down and you will weigh less. Yarrow essential oil can induce perspiration and remove toxins, excess water and salt from your body. It also helps in cooling down your body, thus giving you relief from fever. If you are suffering from hypertension, yarrow essential oil can help you get relief. Have a mild dosage of this essential oil to treat hypertension. This oil has the power to bring down the spikes in your blood pressure effectively and that too without causing any side effects. Yarrow essential oil is great for getting rid of scars and marks on the skin. Applying this essential oil is very effective for fading away post pregnancy scars and the scars left on the skin by acne, wounds, boils, pimples and so on. Within a few weeks of applying this oil, you will start getting positive results and soon your skin will be free from any scars. Yarrow oil can induce sleep and make sure that you get a sound sleep. This is because of its tranquilising properties. This oil is said to have a soothing and relaxing effect on your brain, muscles and nerves. It is effective even for those who are suffering from depression and mood swings. If you are suffering from flatulence, heaviness in the intestine and the chest, chest pain, indigestion, stomach ache or loss of appetite, the reason for it is acidity or gas. If it is left untreated for a long time, it can be dangerous and harm your body. Yarrow essential oil is very effective for this problem. It can remove gases from the intestines in the downward path and also prevents them from building up again. So, try this at home and you will soon get relief. This plant is very beneficial for people suffering from digestive disorders. They get relief from such issues by using this plant. You can consume the oil extracted from yarrow plant in prescribed dosages. This can cure a lot of digestive issues. It is also good for improving the health of your intestines. People suffering from spasms know how uncomfortable they are. Studies made have shown that yarrow plant can cure or help in combating with such extreme conditions of the body. This way it can provide great relief for those who suffer from recurrent spasmodic attacks. Even the big cosmetic brands are considered less effective compared with yarrow essential oil. This shows how effective this oil is. Applying this oil on your skin can make your skin look younger as well as healthy and gorgeous. It is also great for clearing the marks left by acne and for treating other skin infections. Yarrow essential oil has healing power. So applying this oil on the wounds helps in forming a protective layer over the wound, thus preventing it from getting septic. So, you can use this oil as an antiseptic and treat minor wounds. Yarrow essential oil is good for treating cold and cough as it is a natural expectorant. It can cure cold and phlegm. If you are suffering from congestion in the chest, you can clear your respiratory tract within a short time with a few drops of this essential oil. Yarrow essential oil has the ability to optimize the metabolic functions of your body, like the absorption of essential nutrients in the body and decomposition of the food that you consume. So, you can say that this oil gives a boost to the metabolism of the body. This in turn helps in toning your whole body. Yarrow essential oil has been used from the ancient times for treating various health conditions. It can get you relief from tummy aches, cold and so on. Yarrow essential oil is also good for treating varicose veins and some skin diseases, burns and wounds, constipation and infections in the digestive system, and so on. It also helps in keeping your reproductive and urinary system healthy ad in good condition.